High school kids, cars, and snow form a frightening cocktail of immaturity and danger. I have a vivid memory from my Sophomore year when a friend was giving me a ride to a holiday party. There was snow on the ground, and he was trying to be cool by spinning his tires and flying around corners. Mostly, I think he was just getting a kick out of freaking me out. As we were turning into the driveway, he lost control of his vehicle and hit a tree. Luckily, no one was injured. The thing that sticks out most in this memory is my voice soaring high up into the stratosphere of pitch and cracking several times as I let fly several unsavory expletives. Unfortunately, many people are not as lucky as we were. According to the Federal Highway Administration, 11,600 people are injured every year in car accidents on snowy, slushy, or icy roads. As we’ve already had a few good snowfalls this year with certainly more on the way, I thought I’d take the opportunity to make sure everyone is staying safe on the road. Step 1 – Make sure you have good tread depth on your tires. Most tires come at 10/32” or 11/32” of tread depth. The U.S. Department of Transportation recommends replacing tires at or below 2/32” of depth. This is where the penny test comes in. Stick a penny in the tread with Lincoln’s head facing downward. Then, say a quick pledge of allegiance to offset the unpatriotic blasphemy. 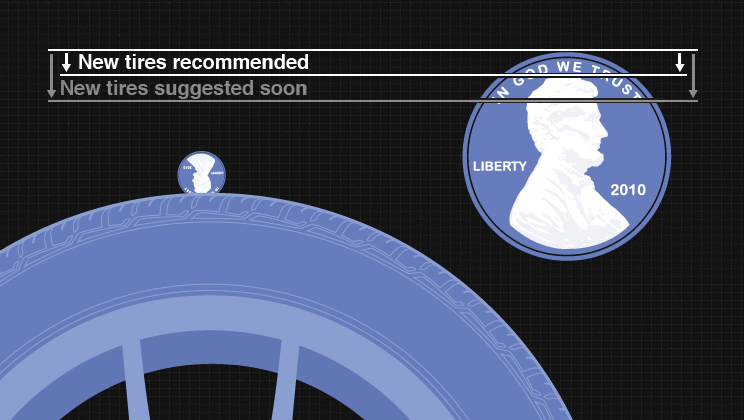 If Lincoln’s head is fully visible, it means you need new tires. Here’s a diagram for those visual learners out there. Step 2- Take a glance at your exhaust pipe. Is it filled with snow? Unclog it. I’m sure carbon monoxide poisoning is as unfun as it sounds. Step 3 – Keep material like kitty litter or sand that you can spread under your tires in case your vehicle gets stuck. Also, try to keep a few essentials in the trunk like jumper cables, a flashlight, blankets, and, several thousand dollars in gold bullion, in case of massive grid failure and the hasty formation of a new civilization. Step 4 – Scrape off that ice off your windows and mirrors. Don’t forget to readjust your mirrors after attacking them ferociously with the scraper. And please, get the snow off the top of your car. Leaving a trail of smoke screen is only cool if you’re James Bond. If you’re looking for tips on defrosting your windshield twice as fast, enjoy this sciency advice from science geek, Mark Rober. Lastly, keep your gas tank half full to keep your gas line from freezing up. The most important thing to keep in mind with winter driving is following distance. In adverse weather conditions, stopping takes 3-12 times the distance it would otherwise. A good rule of thumb is to keep 8-12 seconds of following distance between you and the car in front of you. You should also avoid coming to a complete stop whenever possible. Every time you come to a complete stop, you’ll risk getting stuck. If you do get stuck, try not to spin your tires. It polishes the surface of the snow and ice making it slicker. Instead, try to rock your vehicle back and forth until your vehicle is freed ideally while listening to “It’s a Long Way to the Top (If You Wanna Rock and Roll)” by AC/DC. Here’s the best advice I can give; let the weather win, just stay in. If you don’t absolutely have to leave the house, there’s no sense in risking it. That’s why they invented the internet. If you have been in a car accident because of someone else’s negligence, don’t try to handle it alone. Call Joe Patton. He has 40 years of experience and the expertise to ensure you’re well taken care of. Stay safe out there!